Presidential Medal of Freedom is the most prominent U.S. civilian decoration. It is awarded to people who have made an especially meritorious contribution to the security or other national interests of the country, cultural, world peace or any other significant endeavour. Although it is a citizen award it can be awarded to military personnel and worn on the uniform. The recipients of this award are selected by the President with the assistance of the distinguished Civilian Service Awards Board. The medal was established in 1945 by President Harry S Truman as ‘Medal of Freedom’ to honor notable services during WWII but in 1963 it was re-established by President John F. Kennedy. Individuals from other countries are also eligible for this award. On December 6, 1963, President Lyndon Baines Johnson awarded this medal to 31 individuals. Eight of them were awarded with special distinction. Bill and Melinda Gates were awarded the Presidential Medal of Freedom during the last ceremony of Barack Obama as a president. A big white star in the center is the most visible design element. On this, 13 smaller gold stars are arranged in a field of blue color. Behind the white star, there is a red pentagon. The distance between points of the star is bridged by golden eagles. This medal is suspended on a blue ribbon, obtains the color scheme of the presidential seal of the United States. The name of the recipient of the award is engraved on the reverse side of the medal. During a White House ceremony, President Obama surprised Vice President Joe Biden with the Presidential Medal of Freedom. Declan, Tobin. " Fun Facts for Kids about Presidential Medal of Freedom ." Easy Science for Kids, Apr 2019. Web. 20 Apr 2019. 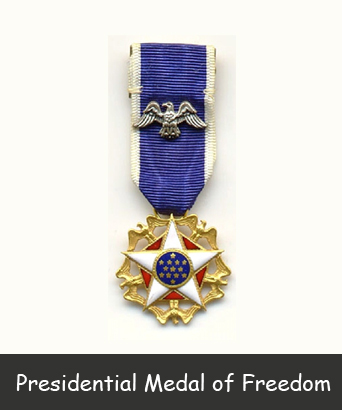 < https://easyscienceforkids.com/presidential-medal-of-freedom/ >.